Two words that resonate as an evidence. Even more when we look closely at the poster of the exhibition, held from March 26 to July 17 2019 at the Institute of Islamic Cultures of Paris. Two men bare-chested, as tanned as hairy, standing proudly at the edge of the Beirut corniche, in a tender and humoristic tribute to this emblematic city of the Middle East. When one speaks about Beirut to someone who has already been there, it is a mixed feeling, both bitter and sweet, that immediately comes to mind. A city as fascinating as confusing, which does not stop destabilizing its visitor by destroying the stereotypes he initially came to look for. Thorough the vision of 16 photographers and videographers chosen by the exhibition curator Sabyl Ghoussoub, author and columnist of Lebanese origin, the event is a complete immersion within this uncatchable city, between fragility and resilience. Both literally and figuratively, it is on clichés that this exhibition dedicated to Beirut opens its doors. 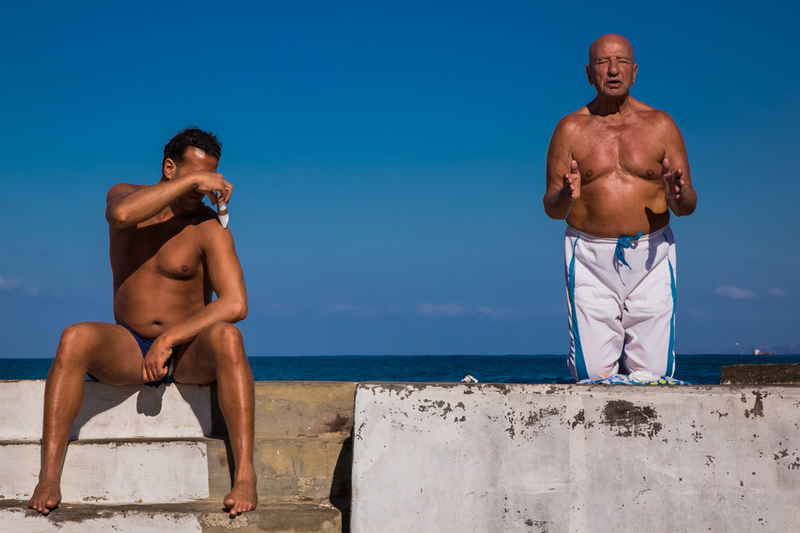 Those of the photojournalist based in London, Vianney Le Caer, with his series Les bronzeurs (the one who tan) who depicts the men who gather daily on the bay of Saint George, in front of the American University of Beirut, to tan, work out and pray. A testosterone concentrate resembling the country where gender roles are still traditionally distributed. But also a small wink to the superficiality and body cult so dear to the Lebanese society, which finally hide so many wounds. The body as identity marker in Lebanon is therefore the first chapter of this event, and also illustrated through two large portraits of police officers made by Ziad Antar, who does not miss to make fun of these officers and their interpretation of manhood, photographing them outside of their context. Comprising 18 religious denominations, Beirut can not be thought outside the lens of religion. 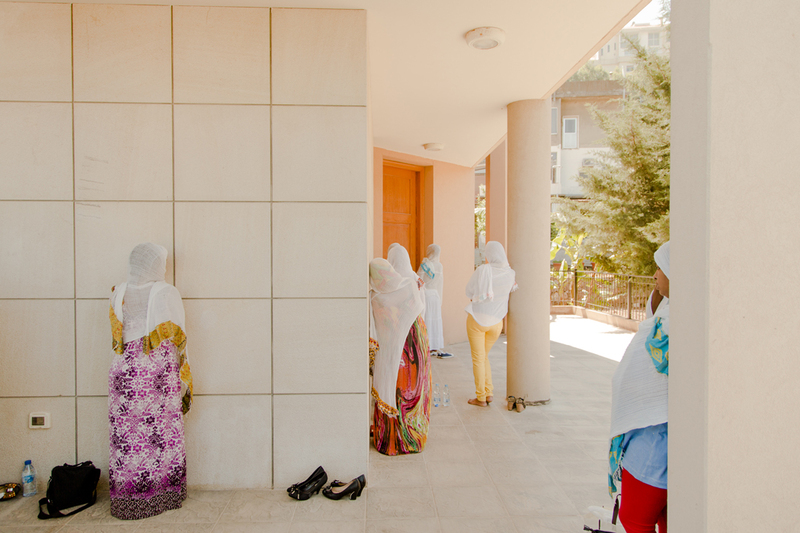 An entire space is dedicated to it on the ground floor of ICI through two emblematic series: Christians of Lebanon, directed by Patrick Baz who followed this community for two years in the fervor of their religious ceremonies. But also an unprecedented series on tattoos of Hezbollah supporters militants who have posed under the lens of Hassan Ammar. Finally, a video of Sirine Fattouh follows in Beirut streets “el tabbal”, the man who wakes the inhabitants at dawn for Ramadan. 56 rue Stephenson, in the second space of ICI, the second floor is entirely dedicated to the isolated and ignored minorities in Lebanon. We can follow their journey through the work of Dalia Khamissy who documented the daily life of Syrian ( more than one million) and Palestinians refugees in Lebanon. But also a video of the writer and videographer Christophe Donner who shows a Palestinian artist working with recycled objects in his workshop of Sabra and Chatila camp. We can also observe the works of two emerging young artists like the Lebanese photographer Myriam Boulos with C’est dimanche (Its’ sunday), a serie of works on domestic women in Lebanon during their rest day, and Mohamed Adouni who is interested in the LGBT + Lebanese community and have lived three weeks with a mother and genderqueer son in the heart of Mar Mikhaël district. The display continues to the Hammam of ICI where we can find an installation of seven videos made by the famous artists Joana Hadjithomas and Khalil Joreige who give the floor to the invisible: workers, refugees, domestic workers who confess to the camera about their daily struggle. So much remains to be discovered at ICI to discover or rediscover the many facets of this cosmopolitan city that keeps reinventing itself despite the conflicts and hardships of history.